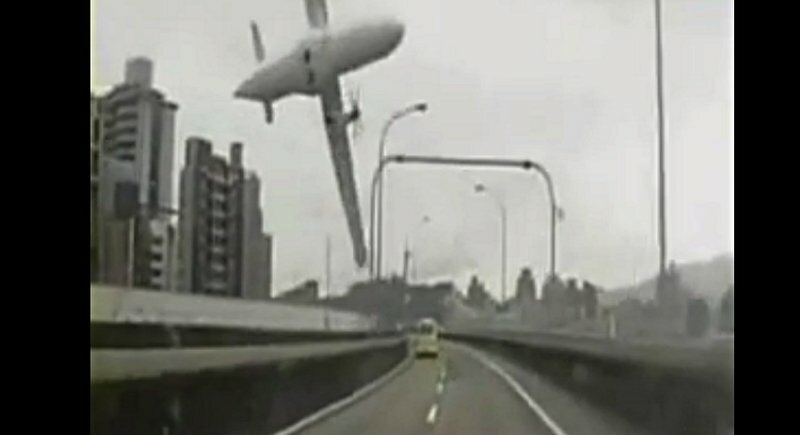 TIAPEI: A passenger plane with 58 people on board plunged into a river outside Taiwan's capital Taipei Wednesday, with 17 people rescued and dozens trapped inside, according to television reports. The aircraft turned on its side before the crash, one wing clipping a road bridge and taking out a couple of cars, then plunging into the river. The TransAsia ATR 72-600 turboprop plane was on a domestic flight when it hit a road bridge before ploughing into the river, the reports said. Rescuers were trying to reach the trapped passengers. Television images showed rescuers standing on large sections of broken wreckage trying to pull passengers out of the plane with ropes. Those who were rescued – including two children – were put in dinghies and taken to the shore. Some were then loaded on stretchers and all 17 rescued have been taken to hospital, reports said. Officials at Taiwanese emergency services were not immediately available to comment. The accident happened just before 11 am (10am Thai time), a few minutes after the plane took off from Taipei's Songshan airport en route to the island of Kinmen.